Delivering premium, double-conversion backup power and scalable battery runtimes for servers, voice/data networks and storage systems, the Eaton 9PX UPS is the ideal solution for both rack and stand-alone installations. An ENERGY STAR qualified UPS (7VA to 11kVA), the 9PX’s graphical LCD interface and robust target power management software makes managing your UPS easy – even in virtualized environments. The Eaton 9PX offers best-in-class efficiency (93% or better), 28% more power (in watts), and every 9PX includes a network card-MS.
Do you have a power distribution solution for your Eaton UPS? Find the correct ePDU option for your UPS with this guide Top Eaton UPSs matched with Eaton ePDUs. 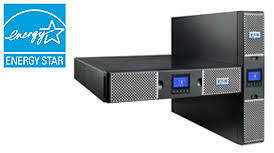 The Eaton 9PX replaces the Eaton 9135, Eaton 9140, Eaton EX RT, Eaton MX and the 5kVA and 6kVA models of the Eaton 5125.